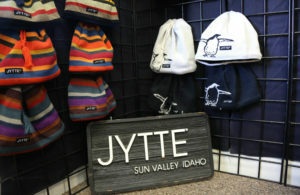 Entering Jytte’s shop is like walking into a tangible record of nearly every JYTTE beanie to date. Every wall is covered with beanies and bursting with color. There is seemingly every color combination and pattern imaginable – dogs, cats, fish, penguins, whales, polar bears, snowflakes, mountains, trees, skiers, snowboarders, mountain bikers, kayakers, handprints, logos, stripes. If you can think it, Jytte can make it. Jytte is an extreme knitter. From her shop in Hailey, Idaho, Jytte designs and creates merino wool beanies that can be found across the globe. No two customers are alike for Jytte. She believes that every beanie has a story and that her job is to translate that story. She has worked with large corporations like National Geographic and One Oceans and smaller organizations like sports teams and first responders. She’s created custom beanies for families, holidays and races. No order is unreasonable for Jytte. Beyond the showroom in a large workshop is where the wool comes to life. This space is home to three large CNC knitting machines sourced from Europe and a handful of smaller sewing machines for sewing fleece liner into the beanies. The room is lit up with a brilliant, colorful wall of wool situated at the far end of the room. The factory is meticulously clean. There is virtually zero waste – an intentional practice for Jytte. Despite manufacturing hundreds of beanies, only one bag of trash leaves the shop per week. Essentially every piece of scrap material is made into something else. Hats with a small hole become fingerless gloves, excess piece of fleece are sewn into cat beds and bits of wool are filled with cat nip and made into cat toys. Jytte donates the pet beds to animal shelters and veterinary clinics, and throws a few cat toys in as a surprise bonus. Jytte and her three employees are proof of the passion sewn in to every JYTTE beanie. She takes prides in her craftmanship and their ability to manufacture high quality products with a minimal eco footprint.